Is Carlisle Companies Inc. (CSL) A Good Stock To Buy? Insider Monkey finished processing more than 700 13F filings made by hedge funds and prominent investors. These filings show these funds’ portfolio positions as of September 30. In this article we are going to take a look at smart money sentiment towards Carlisle Companies, Inc. (NYSE:CSL). Is Carlisle Companies, Inc. (NYSE:CSL) a buy, sell, or hold? Money managers are betting on the stock. The number of bullish hedge fund bets improved by 2 lately. The level and the change in hedge fund popularity aren’t the only variables you need to analyze to decipher hedge funds’ perspectives. A stock may witness a boost in popularity but it may still be less popular than similarly priced stocks. That’s why at the end of this article we will examine companies such as Equity Lifestyle Properties, Inc. (NYSE:ELS), News Corp (NASDAQ:NWS), and Targa Resources Corp (NYSE:TRGP) to gather more data points. How have hedgies been trading Carlisle Companies, Inc. (NYSE:CSL)? Heading into the fourth quarter of 2016, a total of 24 of the hedge funds tracked by Insider Monkey were long this stock, a 9% jump from the previous quarter. 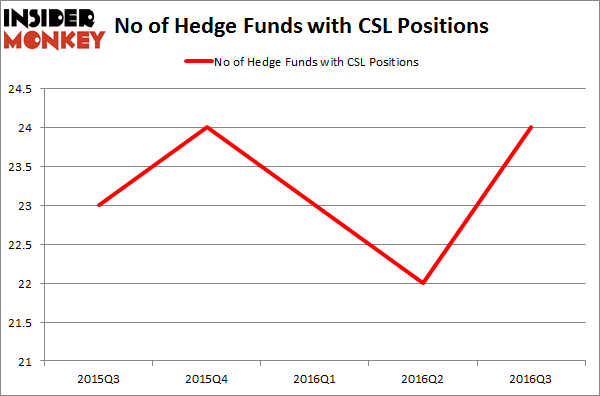 Hedge fund ownership of CSL has remained in an extremely narrow range during the past five 13F reporting periods, with between 22 and 24 funds long the stock during each period. With hedge funds’ capital changing hands, there exists a few notable hedge fund managers who were upping their stakes significantly (or already accumulated large positions). When looking at the institutional investors followed by Insider Monkey, Cliff Asness’ AQR Capital Management has the most valuable position in Carlisle Companies, Inc. (NYSE:CSL), worth close to $74.1 million. Coming in second is Robert Joseph Caruso of Select Equity Group, with a $62.7 million position. Remaining hedge funds and institutional investors that are bullish comprise Israel Englander’s Millennium Management, Anand Parekh’s Alyeska Investment Group and Matthew Lindenbaum’s Basswood Capital. Hedge Funds Keep Selling Allstate Corp (ALL) Vulcan Value Partners Talks Oracle (ORCL)’s Value, Plus New Positions... Is First American Financial Corp (FAF) Going to Burn These Hedge Funds? Smart Money Is Going Crazy for CoreCivic Inc (CXW) Is Charles River Laboratories Intl. Inc (CRL) A Good Stock for Your Portfolio... Should You Buy General Growth Properties Inc (GGP)?